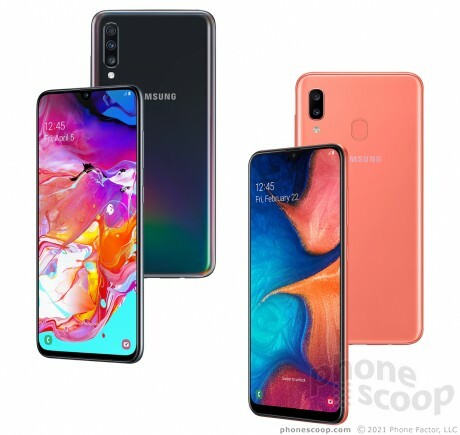 Samsung today published selected details of the new Galaxy A70, A40, A20, and A10 Android phones. These complement the Galaxy A30 and A50 the company announced a month ago. The A70 is the highest-end of the bunch. Although Samsung's A series is generally mid-range, the A10 is a decidedly entry-level model. It's not yet clear which models may come to the US, although the FCC has approved a version of the Galaxy A20 that's relatively friendly with the US networks. All of the new models have extra-tall displays with small centered notches and Android 9.0 (Pie). A70: Sports a large 6.7-inch AMOLED display with full-HD resolution and 20:9 aspect ratio. It also has 32-megapixel cameras on the front and back, additional wide and depth cameras on the back, a huge 4,500 mAh battery, 25W Super-Fast Charging, in-display fingerprint reader, 6 or 8 GB of RAM, and a "Glasstic" body like the A50. A20: A more affordable model with a large display and battery. The AMOLED display measures 6.4 inches and has HD resolution. It has a 4,000 mAh battery, fast charging, 13 megapixel main camera with f/1.9 aperture, 5-megapixel wide camera, 3 GB of RAM, and a rear fingerprint reader. An unannounced Galaxy A60 has also been approved by the FCC, although the approval reveals little about that model. Samsung is going in a new direction with its A series of mid-range phones. Previous models married an understated but very premium design with popular features like Samsung Pay, with mid-range specs and prices. Alcatel's A50 / Pulsemix is an inexpensive Android device that features swappable rear covers. Care to put on a light show? The Galaxy S10 isn't Samsung's only new phone with an in-display fingerprint reader; the Galaxy A50 also has this new technology. Samsung announced two new A-series phones today: the Galaxy A50 and Galaxy A30. Will these models be available in the North American Market or just China and India that usually seems to be the case. Meaning just the J for Junk Series and the S for Super Expensive in the North American market. No M series as well for North America. Notice a trend? Either the Flagship or the Low-End phones for North America. No Mid-range selection at all. Last year, the A6 came to basically all US carriers except Verizon. That was a good start.